In this post I introduced the concept of the Transition Phase. 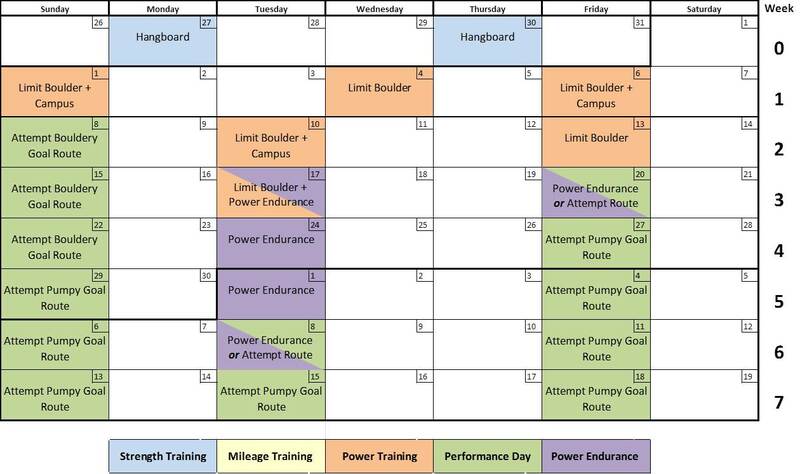 This is the several-week period during each training cycle in which you shift your focus from primarily indoor training to primarily outdoor climbing (and sending!). Chapter 10: Building a Seasonal Training Plan from the forthcoming “The Rock Climber’s Training Manual” thoroughly describes how to build a training plan, and it provides numerous sample plans to get you started. These plans include these transitions, but we’ll talk about some of the “how and why” in more detail here, to help you build your own plan. For most climbers, the Power Phase is typically the Transition Phase, but it could be the Power Endurance Phase for some, or a period of weeks in between that overlaps these two phases. As discussed, it is vitally important that this transition from indoor training to outdoor climbing goes smoothly, with momentum and focus building like a crescendo towards your initial opportunities to attempt the season’s primary goal route(s). However, its much easier said than done. Often, by the time we begin the Power Phase, weeks of ARCing and Hangboard training have likely sapped our appetite for training on plastic, and yet outdoor climbing is still too far away to provide immediate motivation. The lack of structure during Limit Bouldering workouts can further compound this problem, making it easy to lose focus during training sessions. This is the time to re-double your focus and attention on the task at hand. Keep your eyes on the prize, both figuratively and literally. Do the little things on rest days (like eating right, getting sufficient sleep, and minding your skin) to ensure you are prepared to train effectively. The transition phase will usually be a 2-4 week period. At the start of this period, climbers strictly following the Rock Prodigy method will be climbing indoors exclusively. By the end of this period you should be climbing outside as frequently as your lifestyle allows (note: that doesn’t mean climbing every day; rather, it means whatever days you would normally climb or train, in accordance with your pre-planned Seasonal Training Plan, should be spent outside, on your project(s), to the extent possible). The middle of this period will ideally include a gradual transition between the two extremes. Notional Transition Phase training schedule. Let’s consider the example above. The last week of the Strength Phase is Week 0, and a relatively short Power Phase begins with week 1 (for the sake of this example, we are assuming the climber’s goal routes are relatively more pumpy than bouldery, where the climber’s maximum power is not essential). Initially all workouts are in the gym, either Limit Bouldering or Limit Bouldering and Campusing. This early period is the mental crux – this is when you really need to stay psyched to get the most out of your brief Power Phase, and to begin preparing for the upcoming outdoor season. If you’ve not done so already, select your near-term goal routes (considering factors like fitness, weather, accessibility), lay out a detailed schedule for attempting these routes, ask for time off work and arrange for partners. Begin scouring the cloud for beta, take a hike to the cliff if possible to determine sun/shade exposure, protection quirks, or any other info you can scope from the ground. Prepare your finger skin for the upcoming campaign and focus on your diet if weight loss is a part of your plan. 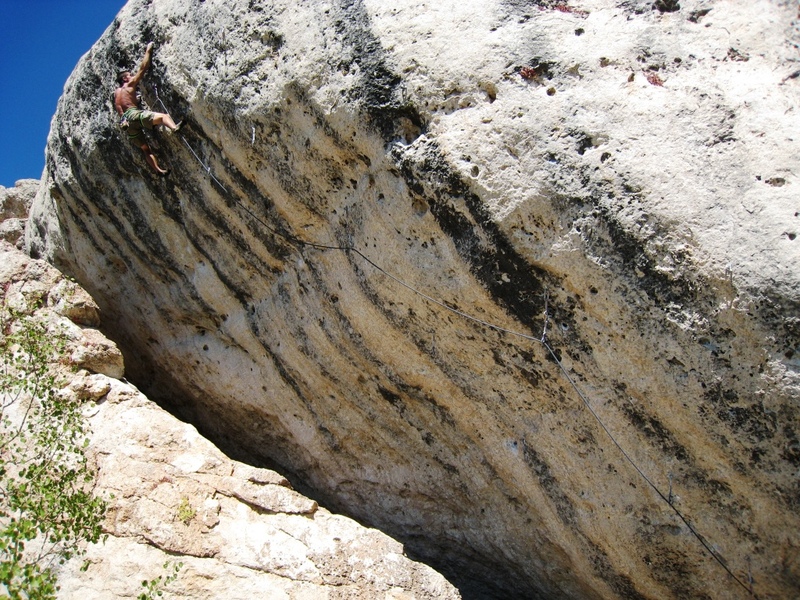 “Roped bouldering” on a potential project is great way to begin the transition to outdoor climbing. If possible, use this time to attempt your goal route’s most difficult moves and perhaps “send” the individual crux boulder problems. BJ Tilden rehearsing moves prior to his 2009 redpoint of Genetic Drifter, 5.14c. Beginning with Week 2, outdoor days are introduced gradually. It’s important to note that these are not just any outdoor days—they are power-focused days, spent bouldering, or “roped bouldering” on your prospective goal route(s). If your season has been planned around one or two important goal routes, roped bouldering on one or both of these routes is ideal. This will allow you to 1) train power somewhat (though roped bouldering is not as effective for power training as indoor Limit Bouldering/campusing), while you 2) scope out your project, and hopefully suss-out the cruxes, while your power is still building (Chapter 10 of The Rock Climber’s Training Manual goes into detail on how to effectively incorporate outdoor climbing days into your schedule to maximize training benefit). The second outdoor day in Week 3 is discretionary – depending on how things are going in your training and climbing. If you feel you are “close” on your goal route and you have the time, climb outside. If you feel you need more work/training, climb inside. In this example, Power Endurance (PE) training is also introduced in Week 3. During the first PE workout (on Day 17), the climber begins with a slightly abbreviated Limit Bouldering workout, and then performs a short PE session with a 10-15 minute break in between. Chapter 8 of The Rock Climber’s Training Manual describes how to blend these two types of training into a single effective workout. By Week 4, the climber is more focused on attempting his or her goal route and less on training, but some amount of Limit Bouldering training is still important to maintain your power throughout the rest of the season. By the end of Week 5 the climber will clearly notice improvement in Power Endurance on the rock. Once again, by Week 6 the climber has the option to pursue more training or more attempts on the project, depending on how things are going. Late in the Transition Phase, climbing outside on a pumpy goal route can provide an ideal training platform, but this only works if the route is pumpy-enough to stimulate improvement AND the climber is hanging on long enough between rests on the rope to get properly pumped. A route like Kaleidescope is ideal because it lacks a stopper crux and seems to get gradually more difficult as you ascend, making it easy to progress gradually up the route as your PE improves. Week 7 is essentially the start of the Performance Phase. At this point, the climber should trade in whatever favors she can to secure the maximum opportunity to send her projects. If her lifestyle doesn’t permit climbing outside at every opportunity, these days can be substituted with short, intense indoor workouts combining bouldering and PE intervals, as explained above. I’d wonder what would be the training plan for someone like me. I live and climb in Portugal, where the sun shines for the most part of the winter (let alone in the summer 🙂 ). Thus, I’m capable of climbing outdoor almost every weekend of the year and, as a consequence, it is very difficult to adopt a training plan with several weeks of indoor training only. Do you think it is possible to follow the rockprodigy method (maybe with adaptations) during the week and climb outside during weekends (perhaps sacrificing some performance climbing)? Or is it pointless to consider the possibility of improving without sacrificing weekend days on rock? Is this possibility covered by your book? I also live in a place (Colorado) that permits year-round outdoor climbing. It’s definitely possible to balance indoor training and outdoor climbing, and our book discusses various ways of doing that. In the long run I think the best approach is to sacrifice some outdoor climbing days each season, and “invest” those days in training. Those training days will make you a better climber, allowing you to climb your projects more quickly in the future. I have been reading your book and blog several times and practicing 2 great hangboard phases and 2 power phases (focusing on bouldering competition) already since the Fall 2014. Great strength improvement for me. Now I want to get ready for routes again. I haven’t found though a lot of details on why your power endurance phase is usually lasting 3 weeks before starting performance phase. Can you give me more details on why 3 weeks would be sufficient to bring back a good level of power endurance? From a physiological point of view. In our experience, Power Endurance improves very rapidly once you begin training it. Three weeks is usually enough time develop a very good base of route fitness, however, the time required depends somewhat on the types of routes you are training for. For more powerful routes, with relatively short segments of sustained climbing, less than three weeks may be enough. 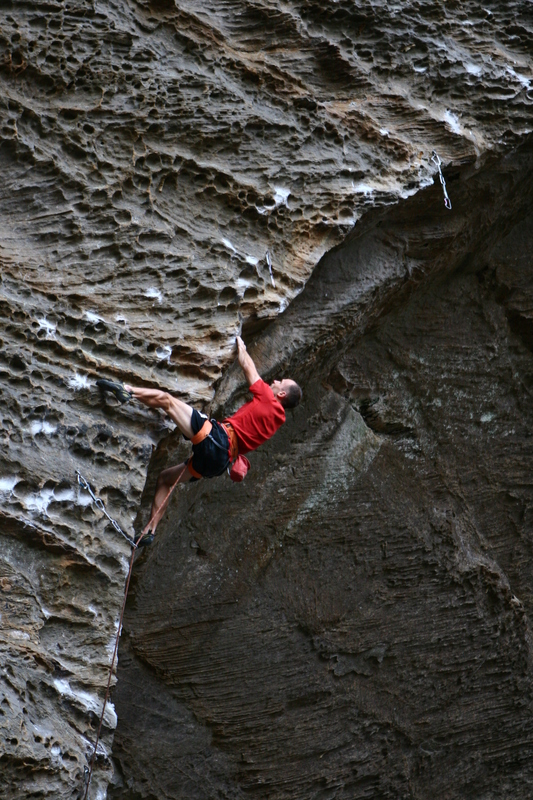 For extremely long routes with no rests and few cruxes, like many of the most popular lines at The Red River Gorge, a longer period of PE training may be preferred. We suggest in the book (see page 165, “Scheduling”) that you should attempt more powerful goal routes earlier in the PE/Performance Phase, and more endurance-demanding goal routes for later in the Phase. If you look closely a the Seasonal Training Plans (p. 186-7), you will see that the PE Phase begins with weekend redpoint attempts on bouldery routes, then later in the phase suggests attempts on pumpier routes, and near the end of the phase suggests onsight attempts. Consider your goals at the Red, and use the schedules as a rough guide to plan the beginning of your PE Phase.